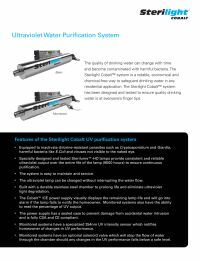 The Viqua Sterilight SCM-200 Cobalt Plus is a whole house water purification system that is designed for smaller homes and offices. This system is small, but it can handle flow rates 8 GPM and under. It will sterilize bacteria, viruses, and many other microorganisms. The UV monitor is included with the SCM-200 and it features a “on” indicator light, a lamp failure alarm, a lamp-life LED display, and a total controller run time. The UV lamp can be replaced easily without having to interrupt the flow of water. 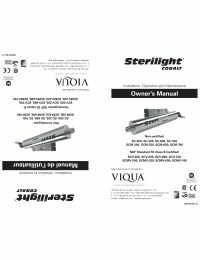 The Viqua Sterilight SCM-200 Cobalt Plus is designed to make maintenance simple, which will ensure many years of service to your home or office. Cobalt ICE controller provides constant output current and a universal power input. Controller alerts user with alarm if UV lamp fails.